My Crystal Bliss subscription box – crystals on your doorstep! Create Blissful Energy in Your Life with Crystals! You unwrap a delightful package of bliss and light! See the preview box on our Facebook page! Order Your New Crystal Box Today! Blown away! By the high quality and power of the crystals in My Crystal Bliss’ subscription boxes. I ‘feel’ energy so the strength and loving vibes of the crystals literally jumped out to me. The care and thoughtfulness in selecting only items of high integrity in MCB boxes makes each a treasure. So thrilled! One of the highlights of my month is receiving My Crystal Bliss subscription box. I have collected stones since early childhood, and when I learned about My Crystal Bliss, I just knew I needed to sign up. I am always delighted to open the box and unwrap all the goodies inside. I am never disappointed, and always learn about more about crystals. Jen always provides a “sneak peek” preview of what’s coming up so that’s fun to watch. I highly recommend My Crystal Bliss. Looking for unique, one of a kind crystals to add to your collection? New to the energy of crystals with no idea where to start? My Crystal Bliss is for you! We are a monthly subscription box delivering high quality, high energy crystals, stones, and gifts that will uplift and expand your life. We specialize in crystals that aren't your typical variety found everywhere ... because you deserve new, fresh, and alive with possibility crystals and energetic gifts! We curate with a clear intent of energy, beauty, and connection. 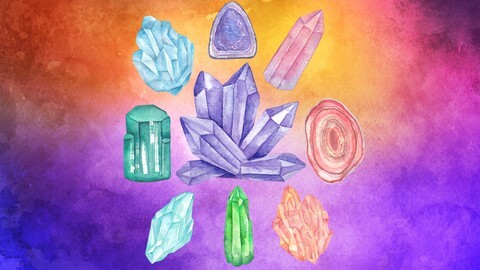 Our parent company, www.CrystallineLight.com, has been offering crystals and stones for almost 20 years, and is now thrilled to offer this service of a monthly crystal subscription box to you. Want to shop for even more high quality + high vibe crystals? Our parent company, www.CrystallineLight.com, has you covered! Want in on special offers? Join the email list for monthly updates + special offers!